In the time since C.J. Leslie’s arrival in Raleigh, the Wolfpack (no Hangover pun intended) have been completely revitalized as a competitive collegiate basketball program. 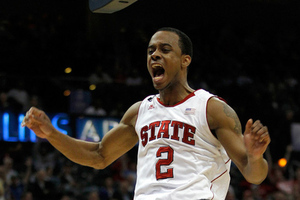 It’s no surprise, though, that most of N.C. State’s success has also hinged on the play of one of the nation’s more premier passers, Lorenzo Brown. Brown –who over his time at N.C. State helped to lead the team to a combined 63-40 record –may not have the most prolific name in the 2013 Draft, but he’s definitely one who’s looking to make his impact known at the next level. Brown has a knack for passing the ball. His 7.2 assists per game this season were tied for sixth amongst all Division I players. Also, Brown faced much tougher competition than some individuals who averaged more than him (players from LIU, Sacred Heart, and Ohio U all finished with “better” numbers than Brown). Another impressive statistic from Brown was his 2.07 assist-to-turnover ratio; it wasn’t the highest in D-I, yet it showed that Brown didn’t try to force anything on offense but allowed the game to come to him. Over his three years, Brown’s passing numbers have increased each year (3.7, 6.3, 7.2), showing that he’s continuing to grow and further break down opponent’s defensive schemes. Also, averaging 2 steals per contest shouldn’t hinder Brown from being drafted; due to his 6-foot-5 frame (large for a point guard), Brown is able to disrupt plenty of passes, and that size (as well as his 6-foot-7 wingspan) will translate well to the next level. When he does get to play at the next level, Lorenzo Brown certainly won’t be his team’s first option on offense. While his numbers were respectable (12.4 ppg), his shooting percentages were less than stellar: .42 FG%, .26 3PT%, and .77 FT%. As an oversized point in the college game, getting by or shooting over smaller defenders shouldn’t have been an issue for Brown, but career percentages of .43 FG%, .30 3PT%, and .74 FT% show that he struggled to step up when other teams keyed in on him defensively. Also, with N.C. State playing a primarily up-tempo offensive scheme, some may wonder how many of his assists were due to his playmaking abilities rather than his ability to move the ball up the court during a fast break. Some may look at Brown and say that his size will help him compete at the next level; others will look at him and say his numbers were the product of playing around more skilled big-men in the right offensive scheme. I say that Brown could surprise people in the League. His numbers, while not perfect, suggest that Brown clearly knows how to play the game, and while he can’t shoot well from downtown, it hasn’t hindered other Southeast region point guards who dropped down draft boards a few years back (see: Rondo, Rajon). His defense, length, and passing skills will help him succeed at the next level. This entry was posted in Home, NBA Draft and tagged 2013 NBA Draft, basketball, C.J. Leslie, Lorenzo Brown, NBA, NBA Draft, NBA Draft Combine, NBA Rookie Class, NBA rookies, NC State, prospect profile, Rajon Rondo, rookies, sports by NBA Rookie Class. Bookmark the permalink.